Hi my name is Eddie Checkley and I have been trading for over 20 years. I am a sole trader with 2 regular sub contractors and other reliable colleagues. We undertake all hard and soft landscaping including patios, driveways, walls in brick or timber fencing, turfing, steps, astro turf and complete garden design. We are experienced in all garden works and ground works and work in the private and construction industry. 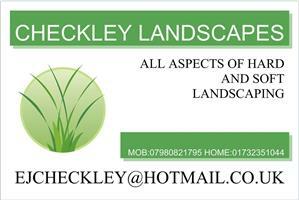 Please do not hesitate in contacting me for free quotations for all of your needs or just to ask for some advice.